For the 24 hours to 23:00 GMT, the USD rose 0.08% against the CAD and closed at 1.3280. In the Asian session, at GMT0400, the pair is trading at 1.3278, with the USD trading slightly lower against the CAD from yesterday’s close. 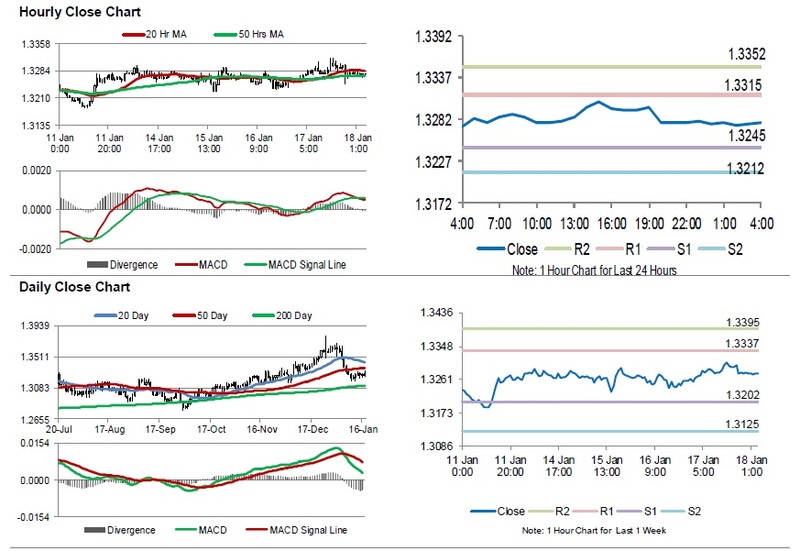 The pair is expected to find support at 1.3245, and a fall through could take it to the next support level of 1.3212. The pair is expected to find its first resistance at 1.3315, and a rise through could take it to the next resistance level of 1.3352. Moving ahead, traders would await Canada’s consumer price index for December, set to release later in the day. The currency pair is trading below its 20 Hr moving average and showing convergence with its 50 Hr moving average. This entry was posted in USD/CAD. Bookmark the permalink.